Cincinnati Milacron Cinturn 8U-40 Series 1208 CNC Turning Center s/n 5320U08-92-0001 w/ Cincinnati Acramatic 950 CNC Controls, 12-Station Turret, Hydraulic Tailstock, 8” 3-Jaw Power Chuck, Chip Conveyor, Coolant. Cincinnati Milacron 10HC-2500 4-axis CNC Horizontal Machining Center s/n 51-CNC-MV21-0519 w/ Cincinnati Acramatic Controls, 30-Station ATC, CAT-45 Taper Spindle, 5000 RPM, 30” (Built-in) Rotary Table, 31” x 66” Contour Table. Tree 3-Axis CNC Vertical Mill s/n 10804 w/ Dynapath Delta 10 CNC Controls, 60-3300 RPM, NTMB-30 Taper Spindle, Chrome Box Way, 10 ½” x 48” Table. 2010 Baileigh mdl. SH-12003-HD 10’ Hydraulic Power Shear s/n 5452 w/ Digital Back Gage Controls, 43” Squaring Arm and Front Supports. Lodge & Shipley mdl. T-60 60” Right Angle Chucking Lathe s/n 41096 w/ 4-225 RPM, 24-Speeds, 42” Face Plate Chuck, 60” Secondary Face Plate, Power Feeds, Tool Post. Clausing Colchester 17” 17” x 86” Geared Head Lathe s/n 7/0017/04446 w/0-1600 RPM, Inch/mm Threading, Tailstock, Steady Rest, 10” 3-Jaw Chuck. Namseon – Acra Turn 18” x 60” Geared Head Gap Bed Lathe s/n N108501022 w/ 20-1500 RPM, Inch/mm Threading, Tailstock, Steady Rest, Trava-Dial. Okuma Type LS 18” x 52” Geared Head Gap Bed Lathe s/n 8463 w/ 35-1800RPM, Inch/mm Threading, Tailstock, Tracer Template Attachment, Trava-Dial, 10 ½” 3-Jaw Chuck. Cincinnati “15” Tray Top” 15” x 54” Geared Head Lathe s/n HT650B w/ Tailstock, Steady Rest, Trava-Dial, 7 ½” 3-Jaw Chuck. LeBlond Makino Regal Servo Shift 15” x 60” Lathe s/n 15C-179 w/ 45-1800 RPM, Inch/mm Threading, Tailstock, 10” 3-Jaw Chuck. Cleereman Jig Boring Machine s/n CJB145 w/ Acu-Rite DRO, 60-1000 RPM, Power Feeds, 16” x 36” Table. Tree mdl. 2UVRC Vertical Mill s/n 10167 w/ Heidenhain DRO, 1.5 Hp. Motor, 60-3300 RPM, Power Feeds, Colleted Spindle, 10 ½” x 48” Table. Cincinnati “Tool Master” Vertical Mill s/n 6J1V5C-900 w/ Anilam Mini Wizard DRO, 140-3800 RPM, 8-Speeds, Power Feed, Colleted Spindle, 10” x 36” Table. Gorton mdl. 0-16A Vertical Mill s/n 28205 w/ 300-5000 RPM, 6-Speeds, Power “Y” Feed, Colleted Spindle, 9” x 24” Table. Sciaky Type VX-54X50X54 Electron Beam Welding System s/n 9266 w/ Sciaky Controls, 54” x 50” x 54” Chamber. Sciaky Type VXHV 60X36X40 Electron Beam Welder s/n 12255 w/ Sciaky Mark VII Controls, (PARTS MACHINE). Jetline mdl. WC-48 Inert Gas Atmosphere Welding Chamber w/ 48” x 48” x 24” Dome, 48” x 48” x 16” Dome Riser, Vacuum Pump, Roller Table and Accessories. S.Blickman Inc. Atmospheric Welding Chamber w/ 48” x 24” x 24” Chamber, Thermal Dynamics WSE Welding Power Controller, Thermal Arc WC-100L Plasma Welding Power Source, Thermal Arc PS-30A Plasma Welding Power Supply, Thermal Arc Cooling Unit. 36” Seam Welder w/ Koike Aronson Track Feed Unit and Accessories. 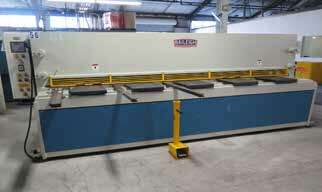 Ferranti Sciaky Type PMC01STM 75kVA Spot Welder s/n 11375 w/ Sciaky Touch-Weld Controls, 39” Throat. Federal Type PA-2-24 200kVA Spot Welder s/n 39707-100-2 w/ Entron Controls, 24” Throat. Miller Syncrowave 350LX CC-AC/DC Squarewave Power Source s/n KK078010. Lincoln Idealarc TIG-300/300 AC/DC Arc welding Power Source s/n AC343397 w/ Cart. Lincoln Idealarc TIG-300/300 AC/DC Arc welding Power Source s/n AC284007. Miller CP-300E CP-DC Arc Welding Power Source s/n HD716428 w/ Wire Feeder and Cart. P & H DCR-200 HFG DC Arc Welding Power Source s/n 33760-R6. Miller Coolmate-3 and Radiator-1 Cooling Units. Peerless 8” Power Hack Saw w/ Manual Clamping, Coolant. Kalamazoo 8” Horizontal Band Saw. Craftsman Industrial Radial Arm Saw. Grob TypeFB-18 18” Chain Filer s/n 1938 w/ 20” x 20” Table. O’Neil-Irwin 26” Hand Brake w/ Table. Dee Shin mdl. BM-450A Tool and Cutter Grinder s/n 1325 w/ Tooling. Reid No.2-3 6” x 18” Surface Grinder w/ Magnetic Chuck. Cincinnati 14” Precision Tool Grinder w/ Work Head. Hammond mdl. UBG-132 2” Abrasive Belt Grinder. Burrmaster mdl. 760 1 ½” Pedestal Belt Sander. Fisher Scientific mdl. 93-609Q Safety-Flow Laboratory Flow Hood. Kewaunee Scientific Airflow Supreme Fume Hood. 3Hp Horizontal Air Compressor w/ 3-Stage Pump. Hill Bros 5Hp Horizontal Air Compressor w/ 2-Stage Pump. Worthington Vacuum Pump and Tank. Koolant Koolers HVC 10,000PR-NF-L-FILT Cooling Unit s/n 10642. Sterlcool mdl. APF1-AQ Cooling Unit s/n S054F93. 6’ x 10’ Fabrication Table. Pratt & Whitney 24” Tilting Motorized Rotary Table. Pratt & Whitney 24” Motorized Rotary Table. Peerless 4th axis 18” Rotary Table (NEEDS WORK). Cadillac and True-Trace Hydraulic Tracer Units. CAT-50 and CAT-40 Taper Tooling. NTMB-50 and NTMB-40 Taper Tooling. KDK and Kirkelie Tool Posts and Tool Holders. Troyke 9” x 9” Rotary Cross Slide. 9”, 8” and 5” Compound Dividing Heads. Insert Turning and Boring Tooling. Clark mdl.CF40B 4000 Lb Cap LPG Forklift s/n CF40B-637-815-1266. D & R Crane Inc. 2-Ton Cap 6-Post Free Standing Gantry Crane s/n 13383 w/ Wright Electric Hoist, Approx. 40’ Bridge Span, Approx. 55’ Rail Length (Located at 1375 Fayette St., El Cajon, CA. 92020). Stanley Vidmar “The Stack System” Pallet Storage System w/ (14) Sections of Pallet Racking, 2000 Lb Cap Pallet Lift/Mover, Free Standing Rail System. Presto mdl. PS2762-50MOD 2700 Lb Cap Electric/Hydraulic Pallet Mover s/n 31149. Presto mdl. PS2762-50 2700 Lb Cap Electric/Hydraulic Pallet Mover s/n 12961.